Please note: The information about the Walters ancestors has been retrieved from records on FamilySearch.org, which I have not personally verified, therefore assumptions have been made. 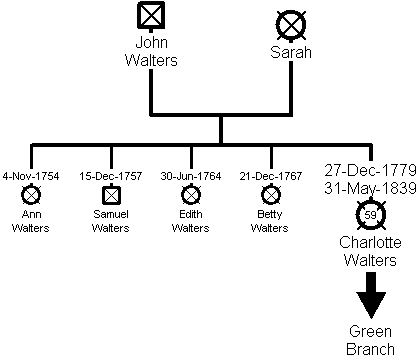 The earliest known Walters ancestors are John Walters and his wife Sarah. They had five children all baptised in Sherborne, Dorset. The youngest, Charlotte Walters was baptised on 27 December 1779. Charlotte Walters was baptised on 27 December 1779 in Sherborne, Dorset. She married William Green on 22 February 1799 in the neighbouring village of Castleton. William was a soldier with the 11th Light Dragoons in the British Army. It is believed that Charlotte would have travelled with him and the regiment as they moved about the country. It is also believed that they had at least one child. Charlotte died on 31 May 1839 in Sherborne.